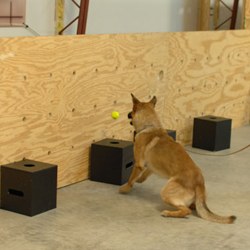 K9 Solutions Center is a state of the art facility designed for K9 training and classes. K9 Solutions Center was founded in 2000 for the purpose of providing private drug dog services. This business was operated on a small scale until 2008 when we began construction on our current facility, a 5,500 sq/ft state of the art training center. Most companies that operate canine companies operate out of an existing building. K9 Solutions Center built our training center specifically for odor work and training. The design of the building takes into consideration control of airflow, temperature, lighting, distraction (audible /visual) as well as other environmental factors. We have an air flow system setup that we can transfer all of the air in the 4,000 sq/ft training area in 3 minutes. This is important when working with large odor hides, and to our knowledge, no other training center has this in place. Our attention to detail is what sets our dogs above our competition. We have a classroom with full AV equipment, in house leather store with a full line of Amish handmade leather canine products, as well as other training gear. Our reflective duty shirts are also made in house, and can be custom make on site for departments or clients. Our kennels are Mason Ultra-base kennels, and are the best on the market. We are able to keep the dogs in top condition with this environment. All of this is located on State Route 235, 2 miles north of Interstate 70, easy access from exit 41.